NBA history is littered with players who flourished on championship teams, but as soon as they went elsewhere – leaving behind that success-ensuring, protective cocoon – never again approached the same level of individual performance. 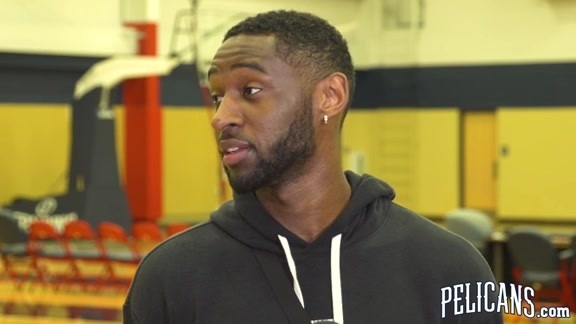 After signing in free agency with New Orleans in August, Ian Clark hopes to demonstrate that he wasn’t a quality reserve guard the past two seasons merely because he was surrounded by elite talent, on a historically-great Golden State squad. Clark is grateful for his tenure with the Warriors and smiles when he thinks back on the experience, including consecutive NBA Finals trips and a 2017 NBA title. But as a member of the Pelicans, it’s now time to stand more on his own. Clark explained that his choice to sign with the Pelicans was influenced partly by a talk with DeMarcus Cousins, as well as the Golden State background Clark shares with Alvin Gentry, a former Warriors assistant coach. The 6-foot-3, 175-pounder envisioned his style of play fitting well with how New Orleans plans to attack opponents in 2017-18. Based on Basketball Reference’s play-by-play data, Clark has played roughly two-thirds of his NBA minutes at shooting guard, with about one-third at point guard. In Golden State, he often shared the second-unit backcourt with point guard Shaun Livingston, moving Clark off the ball, resulting in open spot-up attempts on the perimeter (career-high 37.4 percent on three-pointers last season). With his new team, Clark sees himself as a combo guard, able to play either position depending on lineups and matchups. “Utilizing my shooting and scoring ability is something I do well,” Clark said. “I’ve never really been a true point guard, but handling the ball and initiating offense are things I can do. I couldn’t do too much of that in Golden State, but that’s how I view myself. Also being able to depend multiple positions is important. Obviously there are bigger wings in the league, so being able to make sure I can defend different matchups is something that can help the team. Perhaps the biggest lesson Clark took from his two-year run with Golden State was the importance of adaptability. On a team headlined by perennial All-Star guards Stephen Curry and Klay Thompson, that also featured veteran backups such as Livingston and Leandro Barbosa, Clark often didn’t know when or how much playing time he’d receive. A perfect illustration of that came March 11, when the Warriors (in)famously rested several of their top players during a national TV game in San Antonio. Clark responded by pouring in a career-high 36 points on 15/21 shooting from the field. “It’s about being a professional, being ready when your number’s called and not taking anything too personally,” Clark said of getting sporadic minutes. “It’s definitely a skill to be able to go five or six games and not play, but then be inserted into a game and be able to play well. Obviously every guy that comes in this league was that (main) guy (on his team) at some point. It’s important when you come in to the NBA that you humble yourself, because there are guys who are better than you, or guys with the same talent level. It’s about being able to work on your craft and getting better as a player.